Leading up to Facebook’s location announcement, there were two schools of thought. Either you thought Facebook Places was going to destroy Foursquare. Or you thought that this new service would help the startup by bringing more awareness to the location field. It appears that the latter is happening. 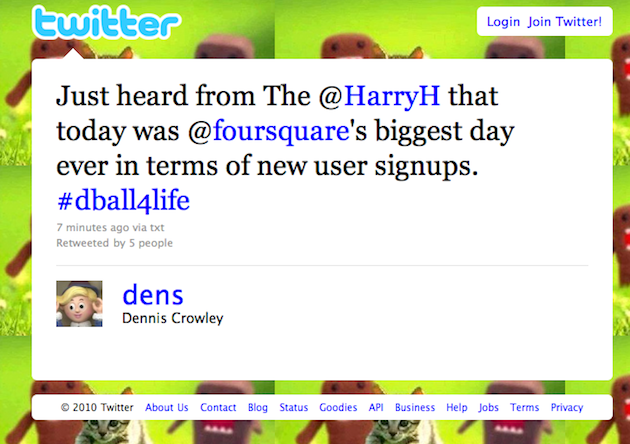 “Just heard from The @HarryH that today was @foursquare’s biggest day ever in terms of new user signups,” Foursquare co-founder Dennis Crowley just tweeted out a few minutes ago (@HarryH is the Twitter name of Harry Heymann, Foursquare’s engineering lead). I’ve long been in the camp that believed Facebook’s entry into the location space would help a lot of these other check-in startups — at least initially. Thanks to the Places API, Facebook is currently serving as a platform for services like Foursquare and Gowalla. And thanks to their 500 million users, Facebook is introducing the concept of location to millions of new users. It shouldn’t be surprising that some of those users are now interested in Foursquare after yesterday’s announcement (and subsequent tidal wave of press). All that said, Foursquare does have to be concerned about what Facebook is going to do in the future. Right now, Facebook’s location offering is very bare-bones, but you have to believe they will flesh it out more as time goes on. In particular, you can expect them to partner with businesses to offer deals and other incentives to Facebook members. You know, the kind of stuff Foursquare is doing. Foursquare clearly has a plan for how they’re going to evolve going forward and stay ahead of Facebook. But they need to execute and make sure they can scale with all this new growth. Earlier today, in an interview with the LA Times, Crowley revealed the service has about 2.8 million members right now. Given his statement tonight, you can expect them to hit 3 million shortly — perhaps even next week. Now it’s a matter of keeping those people around and engaged.